A War Not Won: A tribute to the men of the Army Combat Engineers who courageously served their country during the unpopular Vietnam War. A personal account of the courageous men of an Army Combat Engineer Battalion during our most unpopular war. They faced constant danger from enemy attacks as they cleared jungles, built roads and bridges through dangerous Viet Cong sanctuary areas, built airfields and fire support bases, cleared mines and booby traps, and lived through nightly enemy mortar and rocket attacks only to push further into Viet Cong held territory the next day. They were combat engineers in the finest tradition of the United States Army. General Peixotto is a 1951 graduate of the U.S. Military Academy, earned a Masters Degree from the Massachusetts Institute, is a graduate of the Command and General Staff College, and the National War College. He served two tours in Vietnam. The first as an advisor to the Vietnamese Army in 1959 and 1960. 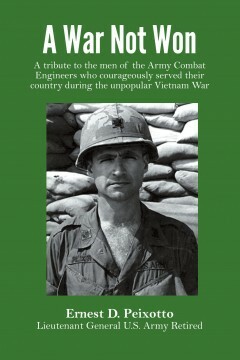 He returned to Vietnam in 1968 to command the 86th Combat Engineer Battalion. He retired from the Army in 1984 with the rank of Lieutenant General. 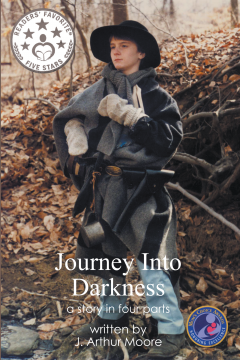 In a war in which more than a quarter million boys age seventeen and under fought in the opposing armies, Journey Into Darkness, a researched blend of fact and fiction, is about a young boy in the Civil War. Written specially for students, enjoyed by adults as well, it takes the student reader into the events of the war through the experience of a peer. Originally published in four books at the request of a young reader on behalf of others who don’t like thick books.